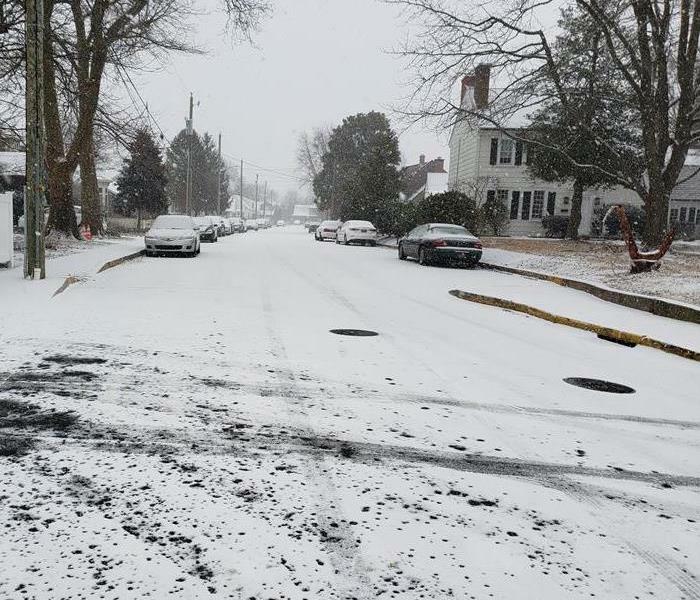 Downtown Lewes during an unexpected snow storm in February. Storms such as these can elevate ground water levels that may lead to intrusion in your home. Obviously with any cold weather storm there is also risk of frozen pipes. 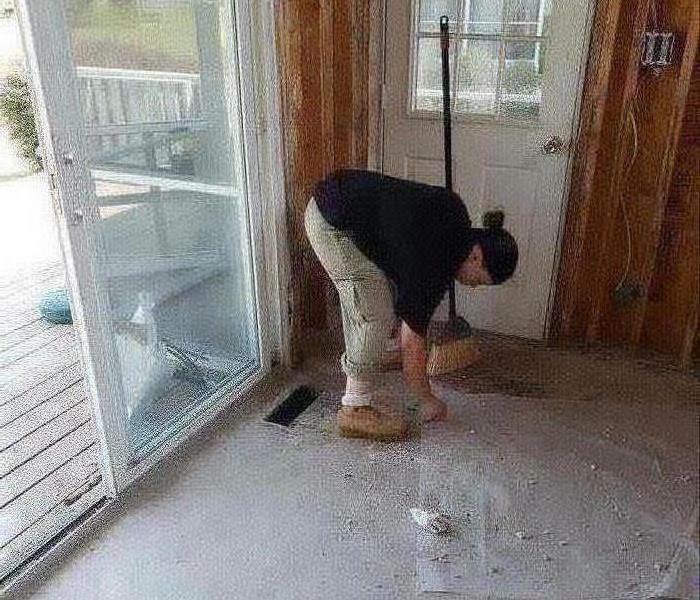 Stay Calm and Call SERVPRO of Sussex County! Ray and Jo Ann Hopkins assist Jordan and Wendy prior to their plunge on February 3 at the Lewes Polar Bear Plunge on Rehoboth Beach. Great Day for a great cause - Delaware Special Olympics! Our plungers did great! 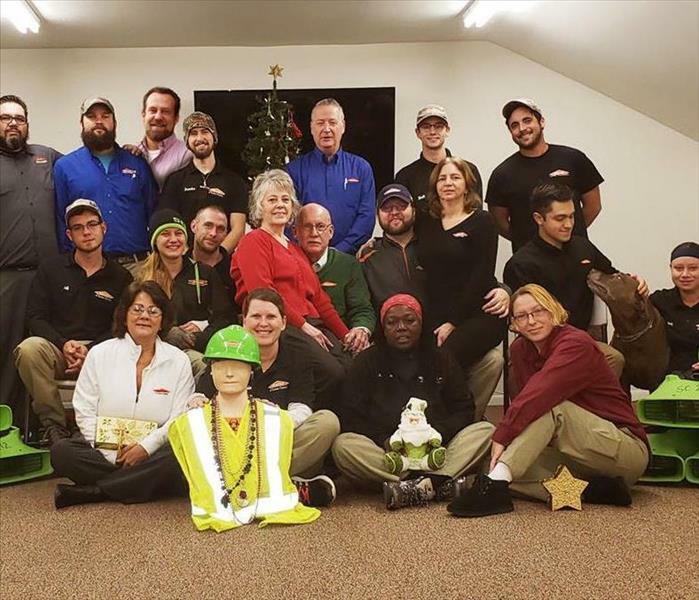 Merry Christmas from SERVPRO of Sussex County! Our festive group photo for 2018! We wish to express to all of our friends and family of customers a very happy and safe holiday season and a prosperous 2019!!! Attendance was great for a great cause - Fire Prevention! Crowds of both young and old turned out for this years National Fire Prevention Day in Rehoboth Beach, DE. The fire department, rescue squads and the local police departments had displays along with SERVPRO of Sussex County. Thank you Chris and Elizabeth! 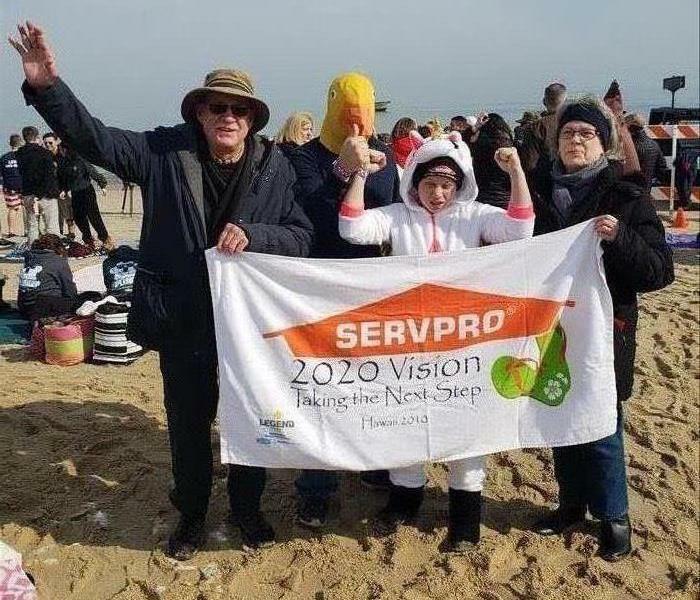 Many thanks to my coworkers Chris and Elizabeth who offered time and hard work to support the presence of our Company - SERVPRO of Sussex County at the Rehoboth Beach Fire Prevention Day. Fire Prevention Day Fun for the Kids! 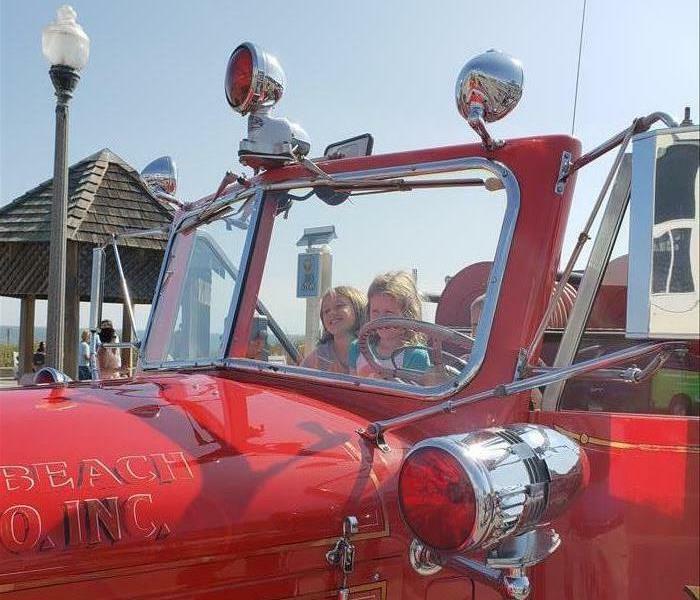 The Rehoboth Beach Volunteer Fire Department had many antique fire trucks on display and many children got to sit in the front seats and ring the bells. This years' theme was: Look. Listen. Learn. Be Aware. Fire Can Happen Anywhere! Fire Truck Bucket Lift Reaches for the Sky! SERVPRO of Sussex County is proud to have been a part of this years National Fire Prevention Day on October 7, 2018. The event was held at the boardwalk bandstand and we joined the Rehoboth Beach Fire Department and other first responder groups for four hours of education and fun! 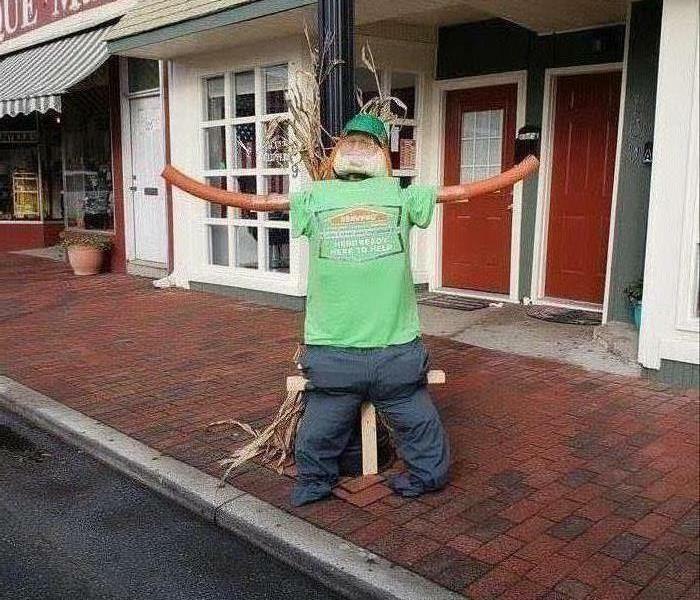 The town of Georgetown is kicking off the Fall season with a Scarecrow contest and above you can see our entry into the event. This event is sponsored by the Arts & Flowers group and we are happy to be a part! Jordan uses a thermal camera to evaluate the amount of moisture present at the Dewey Beach Police Station. High Tech tools such as this make our job easier and more exact. 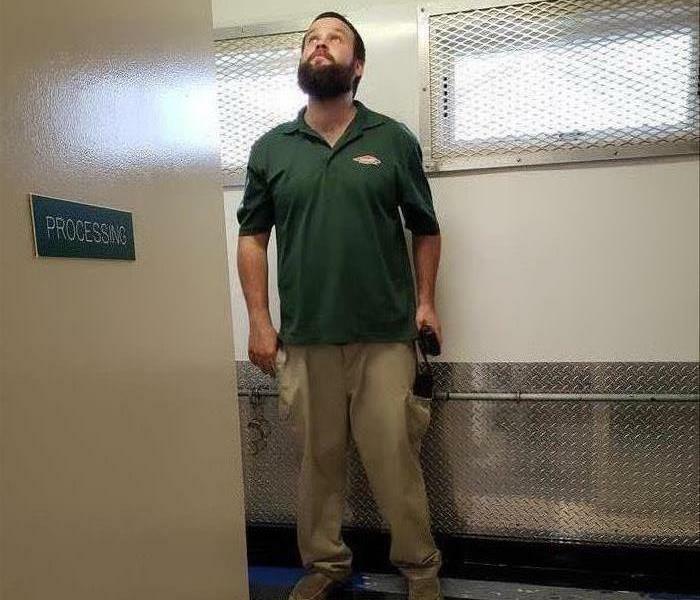 Jordan inspects possible growth at the Holding Cell at the Dewey Beach Police Station. We are fortunate to have a great relationship with all of the town services in Dewey Beach and we thank them for their ongoing support! Fire Damage response requires many steps that need to be completed before remediation is done. 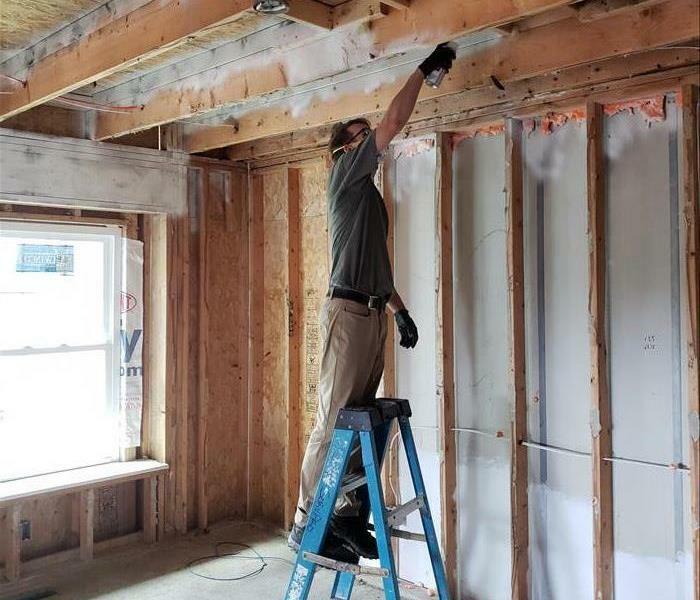 In this photo we can see Matt applying coat and seal at Millsboro fire damage. 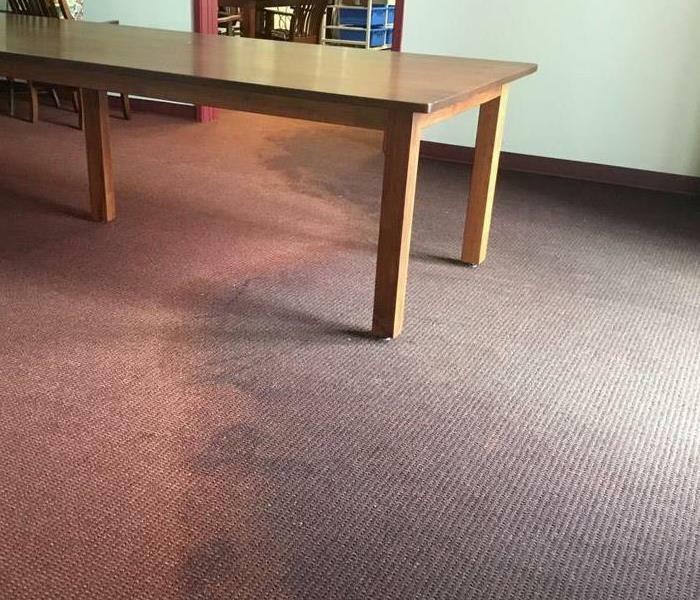 The City of Milford had flood damage from ground water at the Town Library on 9/11/2018. You can see the carpet is saturated before we began work. SERVPRO of Sussex County responded immediately. Brandon - well fed and ready to work! Raley Parker, Manager of Chic-fil-A of Milford surprised Brandon and his crew with a nice free lunch on a job site and we say Thank you Chic-fil-A for your kindness! Chic- fil -A feeds SERVPRO Techs Brandon and Jeff in Milford for FREE! 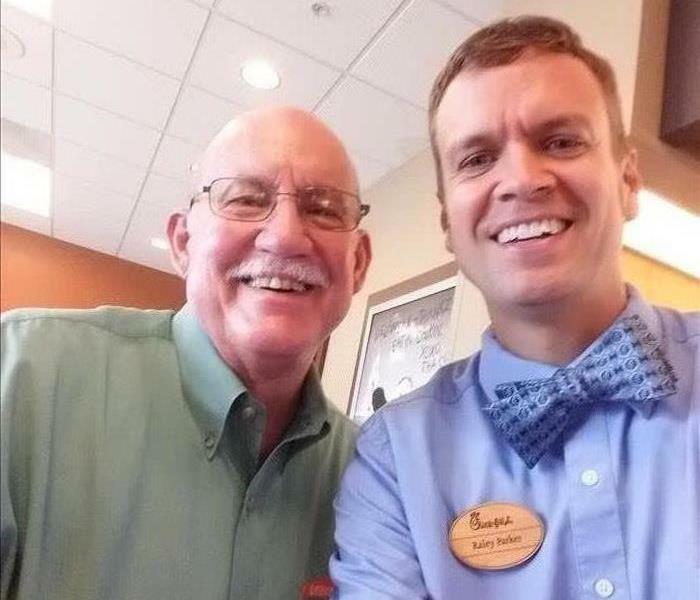 Chic-fil-A Manager Raley Parker poses with our owner Ray Hopkins after offering free food to our technicians, Brandon Seward and Jeff Mitchell in Milford! Thank you Raley and Chic-fil-A for your kindness and generosity!! September has been designated as Substance Abuse Awareness Month and all local businesses are encouraged to display the color purple. 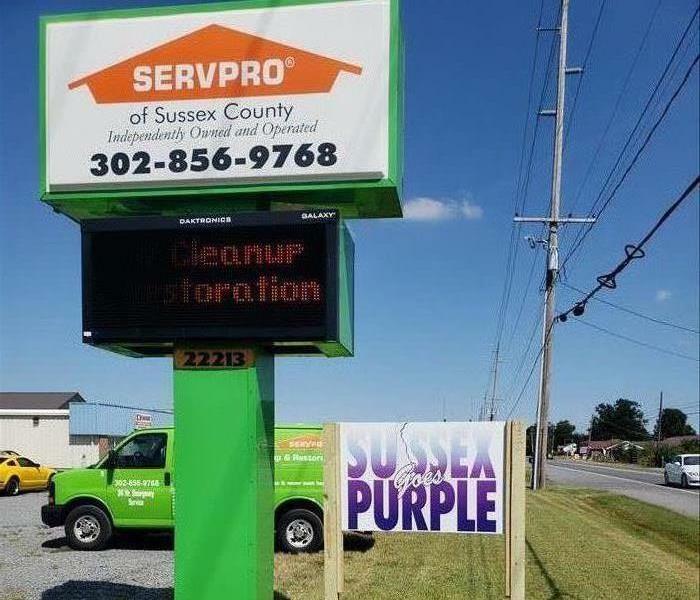 SERVPRO of Sussex County offers support with a purple sign. 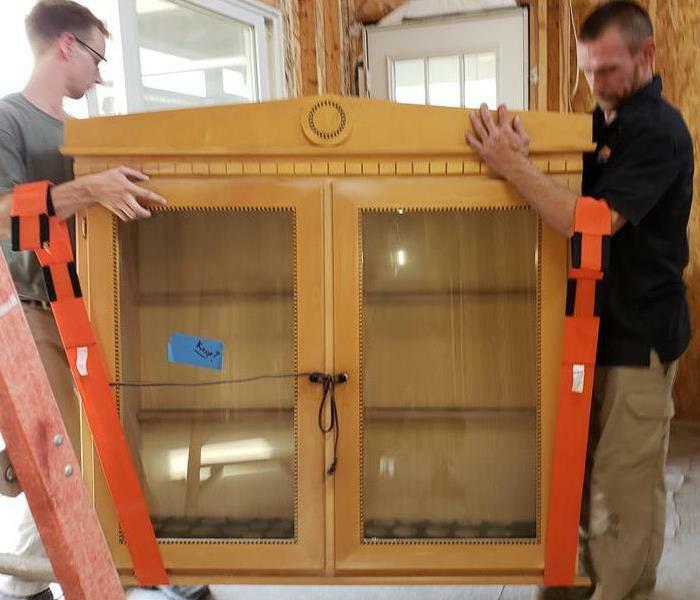 Rob and Matt safely move a cabinet from a post fire clean up scene using a "forearm forklift" which equally distributes the weight of the object and provides a less stressful approach to moving furniture and appliances. .
Allyssa cleaning up after a fire in Millsboro. A house fire is a challenge to remediate and you can see that we check all the nooks and crannies to remove soot and dirt. Wendy, Allyssa and Rob team up to clean up after a house fire in Millsboro, Delaware. Most of our entire crew worked on this big job and everyone did a great job! Wendy cleaning after a house fire in Millsboro. A major house fire such as this will entail several steps of remediation such as structural cleaning and contents removal and cleaning as well. 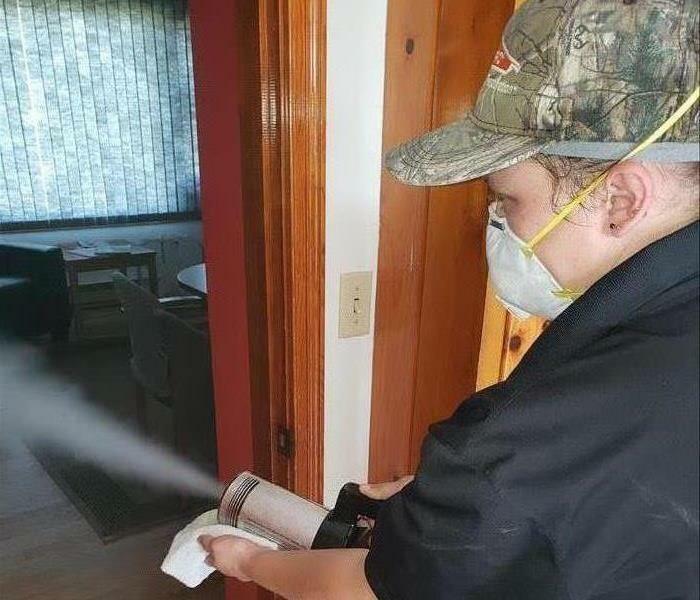 Thermal fogging is an effective smoke odor removal procedure because it recreates the fire related properties of heat and pressurization. 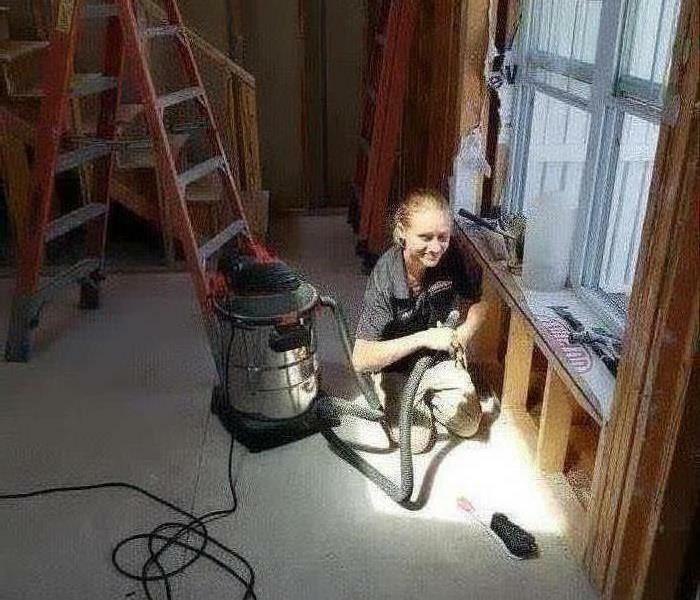 Wendy is fogging after a small office fire in Georgetown. Kyle loading air movers this morning. 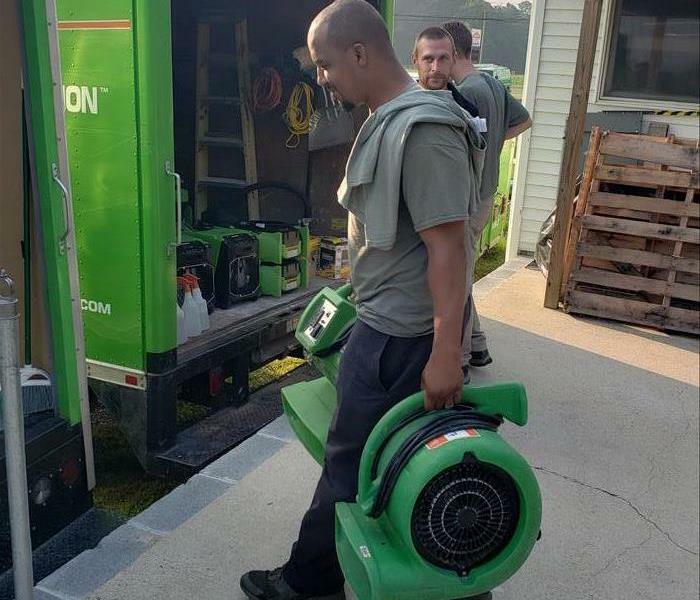 Every job is different for SERVPRO of Sussex County and requires varying supplies and equipment. Kyle is loading air movers, air scrubbers and dehumidifiers for a water loss in Lewes, Delaware. As the work schedule is planned and unfolds; each day begins with the loading of equipment and supplies for the day. Brandon is loading these items in the truck for the workday. SERVPRO's Success Thru Service Campaign recognizes the milestones achieved by each franchise. 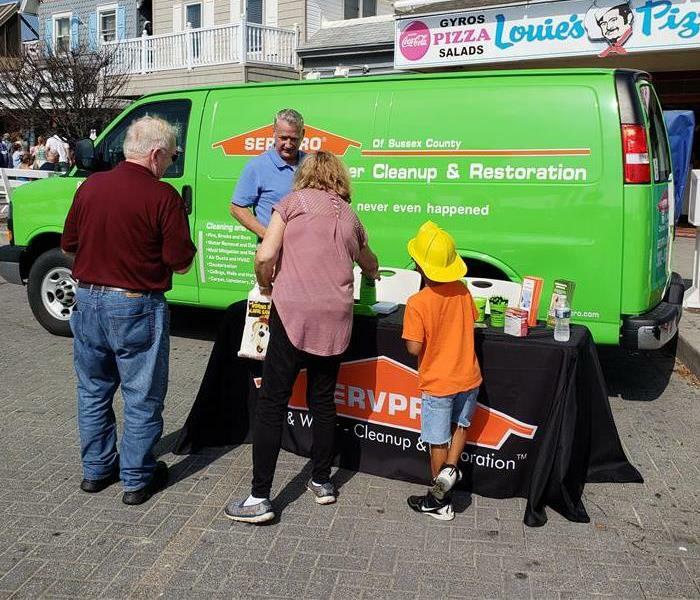 SERVPRO of Sussex County has been offering professional service to our community for more than 25 years! SERVPRO of Sussex County helps the Hunter Emory State Farm Office Stuff the Bus with a school supply donation. Their Campaign "Stuff the Bus" is a local effort to collect and provide school supplies to less fortunate students.